Angel and Faith as a series pairing has always made sense to me. What other two tortured souls from the Buffy ‘verse would fit so neatly together for a tale of redemption? Unfortunately, in the latest instalment of Season 10, our two title characters continue to remain separate but for a brief Skype chat! As tensions heighten between Mary and her classmates at St Cuthberts, Angel literally ‘phones this one in’ as the links between the suspicious deaths in Magic Town and the school finally crystallise. From the outset, Season 10 has been a slow-burner. With Angel still on cross-over duty and no overarching plot reveals in sight, issue 17 doesn’t deviate from this pattern. It’s a paint-by-numbers affair with little more achieved than advancement of the storyline. Ironically, the only element of the plot which does feel fast-paced is the speedy identification of our lead suspects, which in the circumstances feels rushed and a tad forced. Other than the deployment of yet another final panel reveal (a device Gischler seems fond of – though one I will forgive him for, as this one’s a doozy! ), there’s little here to get excited about. Don’t get me wrong, ‘Angel & Faith’ still holds promise. In response to cries for the reintroduction of the ‘Angel Investigations’ gang (Wesley, anyone? ), the return of Fred was a most welcome trip down memory lane. Whilst she doesn’t provide as nice a foil to Faith as Angel does, she’s still a pleasing addition in light of his absence. Plus, if my estimations are correct, the pay-off of the Fred/Illyria storyline is going to be spectacular. In truth, the main issue that ‘Angel & Faith’ currently seems to be suffering from is playing second fiddle to the overarching Season 10 story arc. Whilst Gischler teases enough for it to be certain the storyline will eventually tie into that currently featured in ‘Buffy’, there’s too significant a lack of progression for the series to remain engaging. 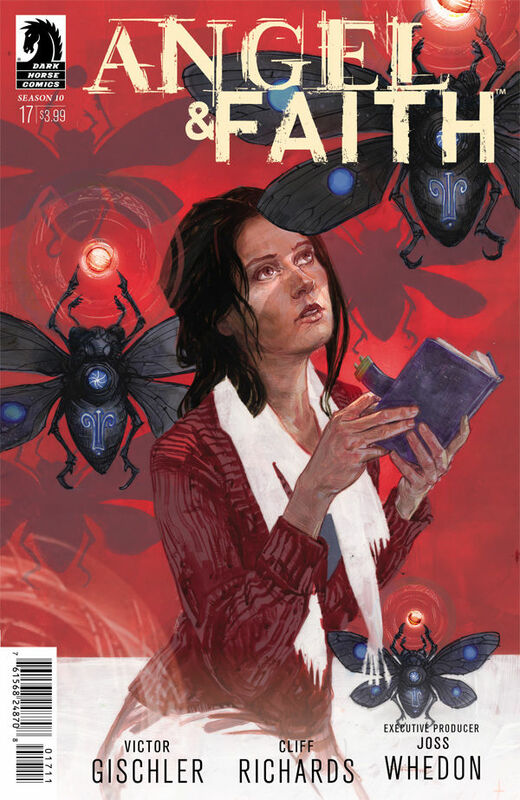 Since the return of Faith to Magic Town, the plot has felt aimless and the storylines of Angel and Faith continue to be too divergent for the comic as a whole to truly gel. The momentum, at present, has well and truly been lost. I’d suggest it’s going to take someone nefarious and blue to get it back on track.